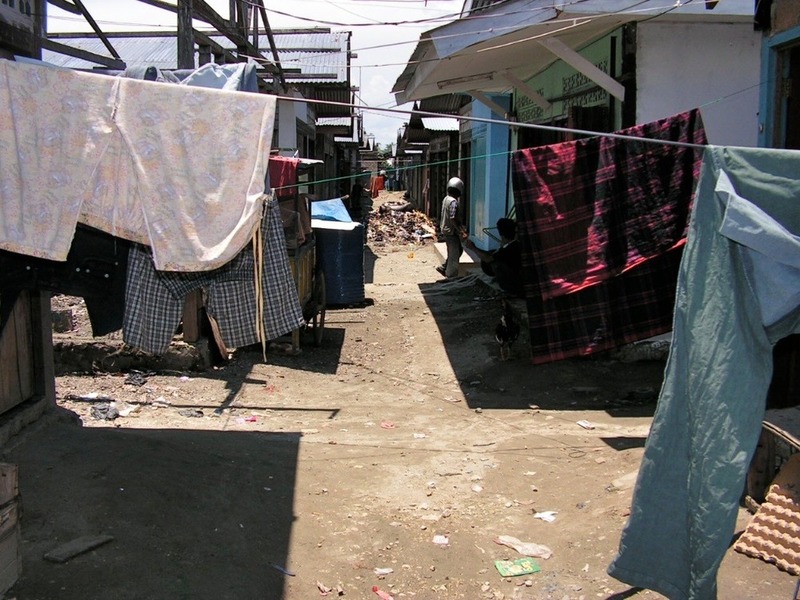 A slum behind the pasar (market) in Sentani, Papua, Indonesia. DiMAGE Z10 6mm at f/3.2 1/100 ISO 64The smell hits you first. You are wandering undering the unrelenting sun and as you approach the pasar, market, it is redolent with the odors of decaying meat, rotting garbage, and unwashed bodies. There is a strength to it that pushes back and leaves the uninitiated wondering if they can continue. The crush of bodies, the sounds of commerce, street style pushes in around you and you begin to wish you didn't need to shop here. Then you see a nod, and you stumble through a greeting in your halting Indonesian. They smile warmly help you correct your words and shake your hand. You wonder if there are any tomatoes this week and soon they are they pulling you through sprawling market to the one corner where they sit, decent sized tomatoes. The market where we shopped for vegetables in Indonesia was a large collection of tin huts, lean-to rooves and tarp covered stalls. It was always full of life and sound and action. One day I wandered out the back and through the little alleys and homes that bordered it. I walked around a corner and glanced through the laundry hanging in front of me seeing a man in a motorcycle helmet coming home. I. Whipped up my camera and snapped just as he disappeared in a home.